Unless the Rochester Americans can win in Syracuse on Saturday night, they can pretty much forget about hanging another divisional championship banner from the rafters. And considering the Crunch thumped the Amerks 6-1 Friday night — the worst loss on the ice of Blue Cross Arena at the War Memorial this season — a victory would seem improbable. But if nothing else, the once-bitter rivalry between the Thruway foes has finally intensified to the degree of yesteryear. First the Crunch built a comfortable 3-0 lead, then they managed to poke and prod the Amerks to the brink of frustration. Or past the brink at times. There were no fighting majors, but it certainly wasn’t due to a lack of trying by Amerks like defenseman Will Borgen and wingers Dalton Smith and Tyler Randell. “Neither team likes each other,” said Borgen, who was often front and center during the periodic scrums over the final 29 minutes. 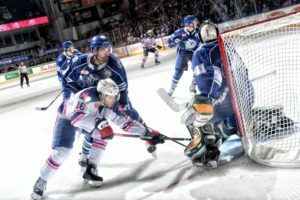 There was something else the Amerks didn’t like on Friday: their propensity to make poor plays with the puck and the most inopportune times. The Crunch scored twice in the final six minutes of the first period and, after Remi Elie and Wayne Simpson both hit posts during a second-period power play, Cal Foote banked a point shot in off the post behind Amerks goalie Scott Wedgewood and Syracuse led 3-0 midway through the game. “They’re a team that lives off their transition and off their power play and we fed into their transition all night,” Amerks coach Chris Taylor said. As a result, the Crunch improved to 45-20-4-3 with four games remaining. They have a five-point lead, 97-92, in the North Division over the Amerks (43-22-4-2), who have five games left. Defenseman Jack Dougherty had that answer. If there is cause for alarm, it would be the past two games against Syracuse, 4-1 and now 6-1 losses. And they were both against goalies that aren’t considered top prospects for Tampa. They lost to just-up-from-the-ECHL Martin Ouellette on March 3 and on Friday scored on just one of 30 shots against just-out-of-college Atte Tolvanen. Wedgewood certainly wasn’t the problem for the Amerks, even in giving up the six goals. He made four A-1 saves in the first period before Alexander Volkov was allowed to skated freely down the slot as the trailer on a Crunch attack. “They capitalized every time we turned it over,” captain Kevin Porter said. The Amerks did revive the rowdy crowd of 7,564 when Dougherty scored at 14:25 of the second period. Then they had two successive power plays to end the period but failed to take advantage. So when Carter Verhaeghe took a thank-you-very-much pass from Amerks winger Tage Thompson in the middle of the slot and dangled in to score at 8:27 of the third period, it was ball game.